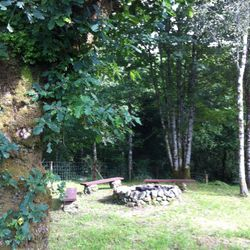 Jura, a two storey and south facing forest cabin is well equipped for your self-catering holiday needs. Small but perfectly formed! It is freshly decorated with tasteful furniture and soft furnishings to provide you with a comfortable stay. 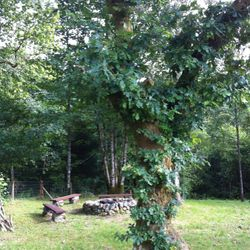 The cabin has 3 bedrooms and sleeps 6 people. 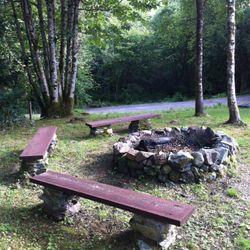 It is positioned on its own private part of the forest complete with a traditional outside fire pit and built in seating area for sole use of cabin guests. Ideal for roasting sausages and toasting marshmallows. Open plan lounge / dining / kitchen area with patio doors leading to a large front deck with open views towards Loch Awe. 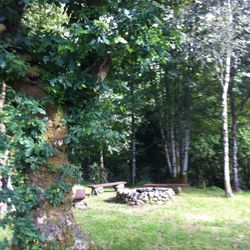 On the ground floor there is 1 double bedroom, a twin bunk bedroom and a bathroom complete with shower. On the upper floor you will find a second double bedroom and a mezzanine area with an additional sitting area complete with TV / DVD player. People can be relaxing on the sofa downstairs or dining whilst others watch TV upstairs, perfect for families or larger parties. The back door leads onto a further large decking area overlooking a private forest area where the outside fire pit is located. There is a flat screen 22” HD television with freeview channels, DVD player, CD player, an iPod docking and speaker system for use during your stay as well as a collection of books, DVDs, board games and jigsaws. Installed in the kitchen you will find an electric oven and hob, microwave, fridge/freezer, toaster, kettle and is fully stocked with crockery, cutlery and cooking utensils. The bathroom has an instant electric shower providing endless amounts of hot water whenever you need it. 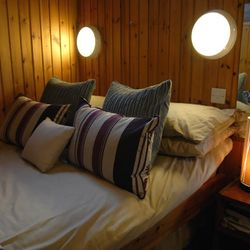 Electric heating in all rooms and double glazing throughout so you will find the cabin very cosy during colder spells. 2 generous decking areas to the front and back complete with garden furniture enabling you to dine and relax outside and providing plenty space for storing bikes, boots and other outside equipment.